GE is airing “Electric Cattle”, a television commercial promoting Jenbacher biogas technology, which creates energy using organic waste from sources like landfills, compost and even cows. The ad opens on a crowd chanting and cheering in anticipation of their favorite band to hit the stage. Suddenly, a cowbell is played, then a drum, then a guitarist is revealed that the band everyone has come to see are cows. After a long moo is sung into the microphone, flames shoot from the stage and the band’s name is revealed as The Electric Cattle. 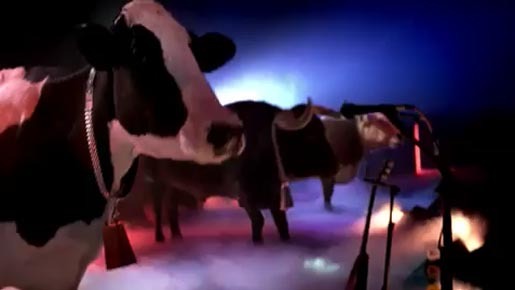 The Electric Cattle ad was developed at BBDO New York by chief creative officer David Lubars, executive creative director Don Schneider, executive producer Regina Ebel, art director Jason Stefanik, copywriter Alex Taylor, producer Regina Iannuzzi and sound/music producer Rani Vaz. Filming was shot by directing collective Traktor with director of photography Chris Soos. Editors were Victoria Lesiuw and Nate Taylor at Crew Cuts. Visual effects were produced at The Moving Picture Company, New York. Sound was mixed by Michael Mannelli at Sonic Union. Music was produced at Frisbie by Mary Frisbie Woods.